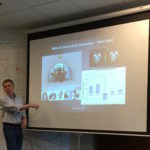 The photos show Prof. Greg Berns of Emory University and Dog Star Technologies presenting recent discoveries from The Dog Project to our Program Manager at the Office of Naval Research (ONR). The Canine Sciences Division of ONR has been gracious in funding The Dog Project. The Project’s mission for ONR is to conduct basic foundation research on canine cognition, emotions, sensory reception, receptive communication, and inhibitory control, with a long-term strategic objective of employing the findings to better identify and train explosive detection and service dogs for military and civilian applications. The Dog Project was co-founded by Prof. Berns and Mark Spivak of CPT and Dog Star Technologies. Since its inception The Dog Project has published 4 peer reviewed academic papers, recently submitted a fifth paper for peer review, and is presently working on 5 experiments that will lead to future publications. In addition, The Dog Project has received notable media attention, including international and national media coverage on the BBC and PBS Nova Series and on the CBS news documentary 60 Minutes. Persons wishing to volunteer their dogs for Dog Project’s safe, noninvasive fMRI programs should contact Mark Spivak by email (MarkCPT@aol.com) or contact the CPT office by phone (404-236-2150). The Dog Project- Greg Presents to our ONR Program Manager. 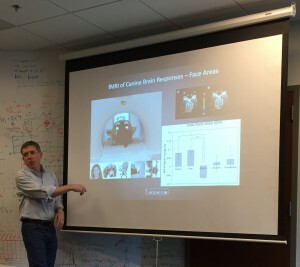 This slide discusses canine facial processing. The Dog Project- Greg Presents to our ONR Program Manager. 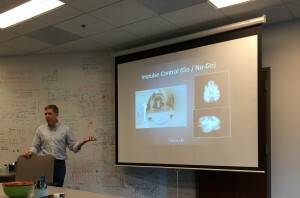 This slide discusses canine inhibitory control in the pre-frontal cortex (PFC) and anterior cingulate gyrus, as studied in one of our fMRI experiments.